To understand and control aging is the aspiration of many scientists. Researchers at the Biozentrum of the University of Basel have now discovered that the protein Gcn4 decreases protein synthesis and extends the life of yeast cells. Understanding how individual genes affect lifespan opens new ways to control the aging process and the occurrence of aging-related diseases. The results of this study have recently been published in Nature Communications. For about one hundred years it has been known that nutrient restriction and moderate stress can significantly prolong life. 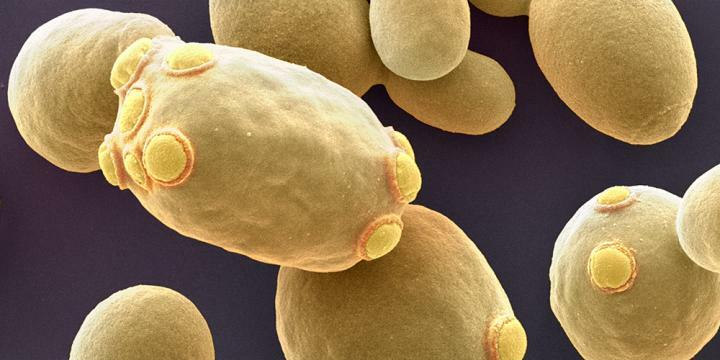 The researchers led by Prof. Mihaela Zavolan and Prof. Anne Spang, both at the Biozentrum of the University of Basel, have discovered how the transcription factor Gcn4, a protein that regulates the expression of many genes, extends the life of baker's yeast Saccharomyces cerevisiae. In various stress situations, the cells stimulate Gcn4 production which leads to reduced biosynthesis of new proteins and increased yeast lifespan. It has long been known that protein synthesis – also known as translation – plays an important role in aging. Inhibition of protein synthesis, caused for example by reduced nutrient intake, can have a positive effect on the life expectancy of diverse organisms such as yeast, flies, worms or fish. Reducing the ribosomes, the protein factories of the cell, can also considerably extend the lifespan of yeast cells. What these cellular stresses have in common is that they activate the production of Gcn4. However, how this protein promotes longevity has remained unclear. In their study, the team working with Zavolan exposed yeast cells to different stress conditions, measured their lifespan, protein synthesis rates and Gcn4 expression. "We observed that the level of the Gcn4 protein was positively correlated with the longevity of yeast cells," says Mihaela Zavolan, Professor of Computational and Systems Biology. "However, we wanted to understand why. We have now shown for the first time that it is the transcriptional suppression of genes that are important for cellular protein synthesis by Gcn4 that seems to account for its lifespan extension effect. As the translation machinery is limiting, the energy-intensive production of new proteins is overall dampened." From the yeast cell's point of view, this is an advantage: This enables them to live about 40 percent longer than usual. The transcription factor Gcn4 is conserved in over 50 different organisms, including mammals, and it likely play a significant role in the aging of these organisms as well. Zavolan's group will now investigate whether the mammalian homolog similarly slows aging and extends lifespan by regulating protein synthesis genes in response to nutrients and stress.